DressCode is an e-textiles and electronics workshop where participants will sew LED lights into their clothing to make interactive costumes that react the sounds and music around them. 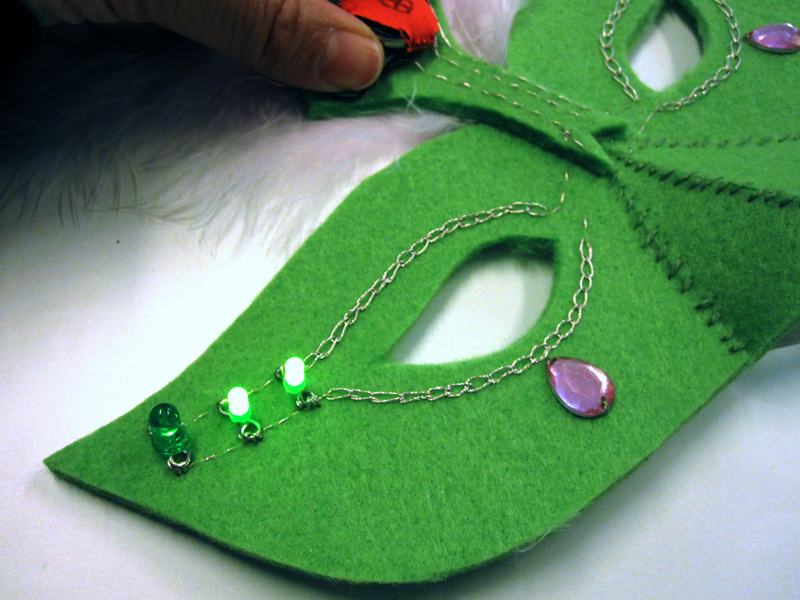 Using conductive thread to sew electrical connections into the fabric of masks, t-shirts, gloves, leggings and hats, participants will learn basic electronics as well as sewing skills. The workshop will be first held at Shambala Festival 2013 and is open to people or all ages, abilities and interests. The project is in collaboration with Vincent Akkermans and Sophie McDonald of MzTek, and Hannah Perner-Wilson and Mika Satomi of kobakant. Participants can bring there own garments be hacked into reactive costumes but we will also be providing materials and templates for masquerade masks. 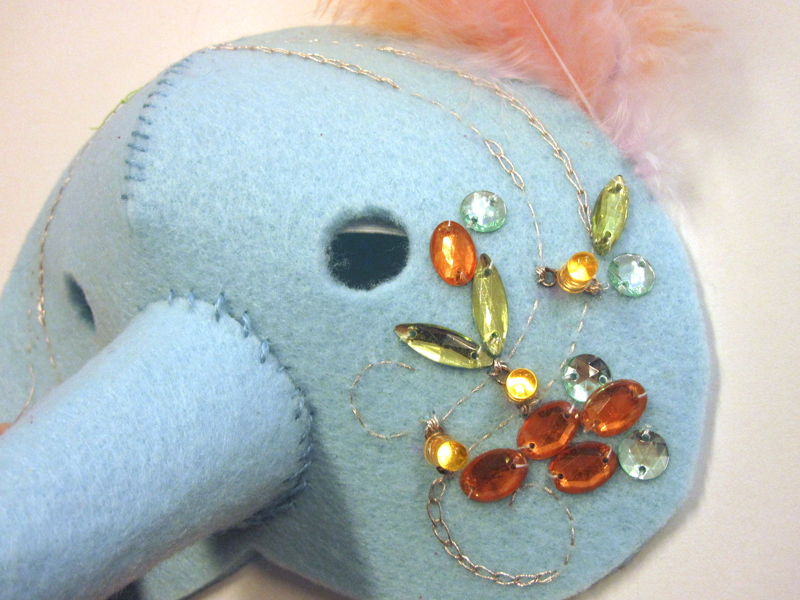 Hannah and Mika used these templates to create two beautiful masks made from felt and decorated with feathers and gems. The LEDs were sewn on with electrical connections made though chain-stitched gold and silver conductive thread. My role in the project has been to create the circuit that will drive the LEDs and turn the sound into light. The design of the circuit has three important requirements: low power, low-cost, and to work for all volume levels from a quite radio at home to a loud sound system at a music festival. The circuit is deigned around a PIC24F microcontroller using PGAs to amplify the signal from the on-board microphone for sampling with the ADC. The three LED outputs are driven by FETs controlled by PWM signals and an FTDI header enables bootloading and serial communication for debugging. The board is powered from a small LiPo battery and has a on-board USB charger. The current firmware implements a envelope follower that partitions a proportionally controlled continuous gain between the hardware PGAs and software gain to maintain a full dynamic range at all volumes. Currently the three LED outputs react to the volume of the sound similar to a VU meter. The video below is a test of the PCB and firmware to show the LEDs responding to the music, battery charging via USB and the real-time display of the audio data streamed over serial using my serial oscilloscope. 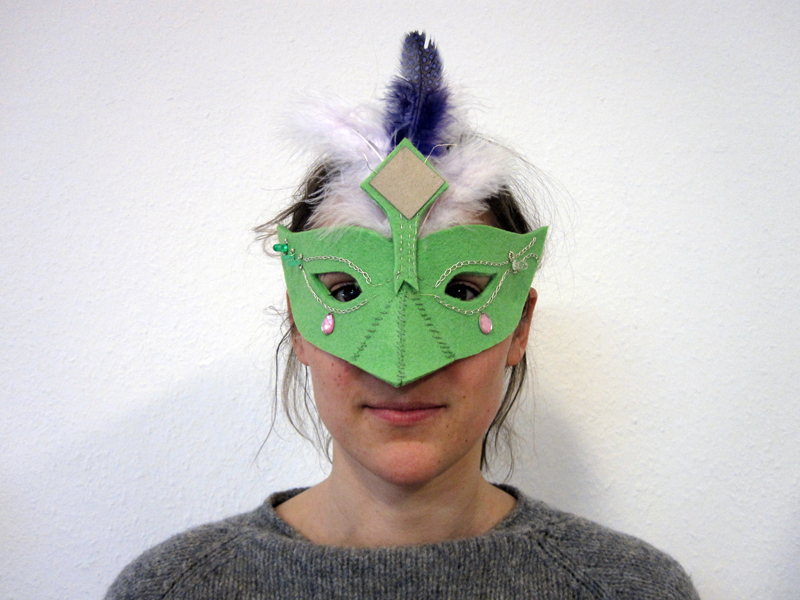 Once the design was tested, I sent a circuit to Hannah and Mika in Berlin to test with the masquerade masks. 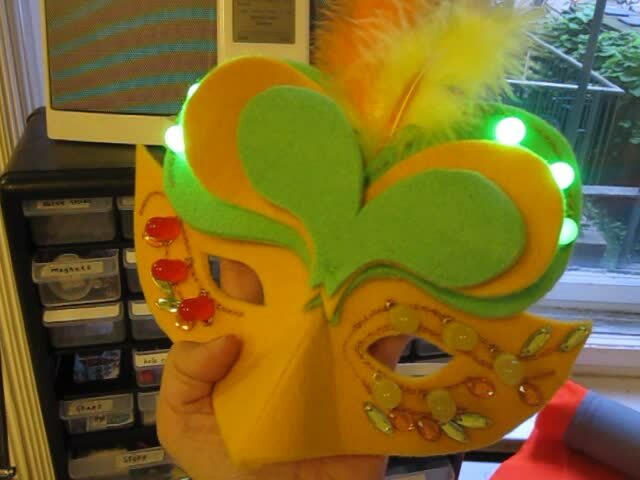 The photo below shows the circuit attached to a yellow mask with copper thread sewn to the thee LED outputs and the video shows the complete mask flashing and pulsing in time with Mika’s music. More photos and documentation of the masquerade mask designs are available in Hannah’s and Mika’s flickr sets. The source files for the firmware and PCB are available on GitHub. Hannah and Mika used the DressCode circuit to make this amazing necklace as a birthday present for a friend, there are more photos of this on Hannah’s blog. 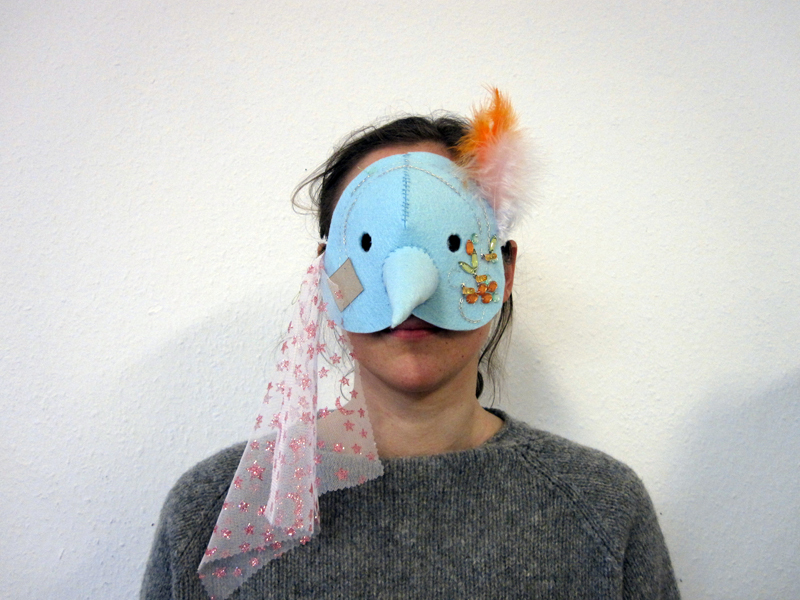 Update (December 2013): Hannah and Mika created a DressCode workshop in Berlin. They’ve create a beautiful instruction booklet and some neck scarf demo videos. Open-source resources are released under the Creative Commons Share-alike 3.0 unless an alternative license is specified in source files.